Captain Moroni | Think Big. It's like benchpress for the brain. Let us raise a standard to which the wise and honest can repair. The rest is in the hands of God. This post is Part 1 in a series regarding the message and the challenge that the Restored Gospel raises against the contemporary political establishment of the United States of America. In 1820, an uneducated and seemingly unremarkable youth in rural New York by the name of Joseph Smith had a miraculous vision in which he beheld God the Father and Jesus Christ. In the years following that vision, he received a number of heavenly manifestations. He was led by an angel to recover an ancient record and commissioned and empowered by God to translate the same. In 1830, by the power of the priesthood bestowed upon him and Oliver Cowdery by angelic messengers, he oversaw the restoration of the Church of Jesus Christ to the world. One of the reasons for which it took so long to restore Christ’s Church was because the world was simply not ready for it. When the nation of the United States of America was established, there was finally a climate of institutionally protected religious freedom. This made the Restoration possible, as the powers of hell would certainly combine to attempt to drive the Church into the “wilderness” (Rev. 12:6) as had occurred previously. Indeed, the powers of hell did combine against Joseph Smith and the Church: despite the Constitution of the United States of America, detractors printed libel against it while mobs assembled to violently persecute the Saints, with multiple state governments passively and actively supporting said persecution. When Joseph Smith met face-to-face with President Van Buren to plead for help from the federal government, the President responded: “Your cause is just, but I can do nothing for you; if I take up for you I shall lose the vote of Missouri.” Such persecution led directly to the martyrdom of Joseph Smith and many others. One can only imagine what would have happened if Joseph Smith had been living in a country that did not value religious liberty. Even so, the strength of the message was not lost, and the Church has managed to thrive to this day, becoming a worldwide organization with over 15 million members. It is the duty of all Nations to acknowledge the providence of Almighty God, to obey his will, to be grateful for his benefits, and humbly to implore his protection and favors. While neither the message nor the Church of Jesus Christ are particularly American in nature, we believe that the Constitution of the United States of America – despite its flaws – was drafted by inspired men, and that the underlying values found in that document and in the U.S. Declaration of Independence are fundamental values in the Gospel of Jesus Christ. Indeed, we believe that the Lord helped to orchestrate the establishment of the United States of America expressly for the purpose of preparing the way for the Restoration of the Gospel, knowing that the resulting religious freedom would allow the Church to take root, and that the Church would also be able to take root in various other countries that would follow the example of the United States by ensuring religious freedom. The inspired nature of the founding of the United States is expressed in no uncertain terms in the revelations published by Joseph Smith and those who came after him. For this reason, it is exceedingly puzzling to me when some of my faith’s detractors promulgate silly conspiracy theories in which they claim that we want to overthrow the Constitution. Our culture, our political tendencies, and our doctrines clearly show that there is little that is of more concern to us than the protection of the Constitution of the United States and the liberties it affords. Anyone who would study our doctrine would see that fact with the utmost clarity. One of the works that most clearly testifies of this fact is the Book of Mormon, the work of scripture translated by Joseph Smith. This text – compiled, preserved, and brought forth specifically for our time – offers both seminal sermons and stories full of dilemmas and figures that may sometimes appear all too familiar. In the Book of Mormon, we see with remarkable clarity that, as Thomas Jefferson and Benjamin Franklin said, “Resistance to tyranny is obedience to God.” In no figure is this message more clear than in the figure of Captain Moroni (“mor-OH-nai”). Moroni (not to be confused with the man by the same name who helped his father Mormon to compile the records of their people) arises in the Book of Mormon’s narrative at a time of great distress. Established by King Mosiah when all four of his sons chose ministry over the throne, the Nephite Republic was still young. This state, coming into existence somewhere in the Americas while Julius Caesar was beginning his ascent to power in the Old World, stood as a rare early example of liberal, representative governance. As the Greek republics once stood boldly against certain subjugation at the hands of the Persian Empire with its vast armies, so did the people of the fledgling Nephite Republic stand against various groups – collectively referred to as Lamanites – who sought to rob, enslave, and kill them. That is correct: Moroni made military decisions based upon the prophetic guidance of a religious leader. This certainly would have been ridiculed by the “division of church and state” advocates of today, but Moroni’s faith proved well-founded: Alma correctly predicted the point at which the Lamanites would emerge from the wilderness and again enter Nephite lands. Marching swiftly to that point, Moroni was able to ambush them at a river crossing and rout them. The Lamanites who survived the battle undertook a vow to never take up arms against the Nephites again and were allowed to return to their homes in peace. Despite the Nephite victory over Zerahemnah’s army, this was anything but the end of strife between the Lamanites and the Nephites. The old hatred remained, and this defeat only contributed to it. The Lamanites remained a constant threat just beyond the border. Shortly after Moroni defeated Zerahemnah, the monarchist movement among the Nephites gained its full strength. A man named Amalickiah arose with the intent to reinstate a monarchical government, with himself as the king. While the majority of the people were seemingly in favor of the new republican model, they were not organized as part of a specific political movement. Amalickiah, on the other hand, was quite organized, and his efforts were fueled by a full measure of ambition, pride, and intellect. The Nephite Republic had a much simpler structure than the three-branch model with which we are familiar. Virtually all political power was given to judges, whose authority was organized in a pyramid structure, with the chief judge at the top of that pyramid. Judges were elected to their positions by the voice of the people, and they could be deposed in like manner. A ruling or decree made by a judge carried the force of law unless it was overturned by a higher judge or by a group of lower judges. It was a simple model, but it was one of the first instances in which an entire nation was ruled by a central government in which no one commanded absolute power, and in which the voice of even the lowliest citizen was taken into account. In his quest to be king, Amalickiah networked with many of the lower judges in the land, promising them higher positions in the new kingdom if they would use their influence to help him. He also flattered various Christian priests with similar promises, convincing them, for the sake of power, not only to abandon their republican and egalitarian ideals, but to abandon their very religion. In this way, a movement that should never have been taken seriously in a nation of representative governance quickly gained momentum. With this new support from the political establishment, Amalickiah and his ilk went about proclaiming the benefits of monarchism to the people. Noting that such a large portion of the educated leaders in their society were part of this movement, it becomes a little easier to understand how Amalickiah managed to convince many of the people to agree to surrender their rights. Seeing the direction things were going, Moroni realized that something had to be done. He knew that Amalickiah was a petty and power-hungry man, and that he would rule as a tyrant. Moroni also knew that many of the rights that were at that time enjoyed by the Nephites would be abrogated. 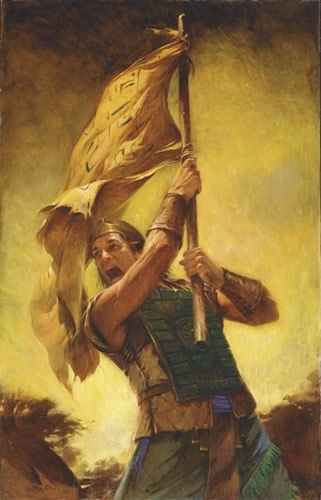 As a result, he tore off a piece of his clothing and wrote the following passage upon it: “In memory of our God, our religion, and freedom, and our peace, our wives, and our children.” Calling this banner the Title of Liberty, he fastened it to a pole and went out among the people, dressed for battle. Behold, whosoever will maintain this title upon the land, let them come forth in the strength of the Lord, and enter into a covenant that they will maintain their rights, and their religion, that the Lord God may bless them. And it came to pass that when Moroni had proclaimed these words, behold, the people came running together with their armor girded about their loins, rending their garments in token, or as a covenant, that they would not forsake the Lord their God; or, in other words, if they should transgress the commandments of God, or fall into transgression, and be ashamed to take upon them the name of Christ, the Lord should rend them even as they had rent their garments. Answering Moroni’s call, the Nephites came together to resist the powers of tyranny. Seeing that they were outnumbered, and knowing that their cause was not just, most of the people of Amalickiah either surrendered or fled. Those who sought to overthrow the liberties of the people had always been in the minority. Their strength had come from their positions of influence rather than from their numbers, and once the people realized their own strength, the power of Amalickiah evaporated. This was not an end to the young republic’s troubles, however: Amalickiah and some of his followers managed to escape into the lands of the Lamanites, where he was eventually successful in seizing the title of king. Seeking vengeance, he then turned the armies of the Lamanites against his own people. However, with the inner vessel cleansed, the Nephite Republic now had the integrity to withstand this onslaught. I seek not for power, but to pull it down. I seek not for honor of the world, but for the glory of my God, and the freedom and welfare of my country. The parallels between this story and the story of our own time are all too clear. There are forces similarly pushing for the overthrow of a free society and the consolidation of power among a relatively small group of individuals – using position, fame, and riches to achieve this end. This is not to say that there is a single conspiracy behind all of our problems. In truth, that is most probably not the case: there are, instead, many small conspiracies working toward this end. Sometimes they work together, and sometimes they cancel each other out, but the general direction of the trend makes it something to fear. Those embodying this force cannot be clearly defined as members of a particular political party, organization, religion, or social group – indeed, it is often embodied by various groups that can sometimes be rivals – but the force exists nonetheless. Some, reading Moroni’s story, would argue that he was actually an overbearing leader – a fascist, even. He did, for instance, put people to death for refusing to take up arms and fight against the Lamanites. However, he only did so after they had already shown themselves to be traitors who had contributed to efforts to subject their country to tyrannical rule. In the case of the Ammonites – former Lamanites who had joined the Nephites and could not take up arms for religious reasons – he made no such demands. (However, the Ammonites did support the Nephites who defended them in every way they could.) Thus, the story of Moroni and the young Nephite Republic is neither an argument for anarchy nor a case of hypocritical statism: the Nephites had a government, and that government did exercise a certain level of authority over the people, but, unlike tyranny in its many forms, the government of the Nephite Republic was strong, consistent, specifically limited, and pragmatically lenient. Conversely, it is certain that the arguments used by Amalickiah and his ilk were similar to those made by statists and cronyists today: You should not trust your neighbor, but you should trust politicians. Give me power, and I will give some of it back to you. You have been marginalized, and it is time for revenge. Your decisions are not the problem: the system is the problem. Others use their power selfishly, so you should give their power to us. Other rulers have been draconian, but we will be considerate. We promise. They invoke a collection of gods with their mantras – Fairness, Stability, Security, Prosperity, etc. – but the core of their dark gospel remains the same: You can only be happy if I rule you. I believe that Moroni was a real person who actually did these things, and I believe that God saw to it that this story would come forth in our era specifically for our benefit. The message that the story of Moroni and the Title of Liberty is intended to convey is this: It is the duty of the citizens of every nation – especially this one – to stand against the forces of tyranny, and if they have the will to fight and the character to do so with unity and compassion, they will win. Even if you cannot accept Moroni’s story as fact, I ask you to accept it as truth. I ask this because we need another Moroni. We need another Title of Liberty. We need a people who value liberty so much that they are all willing to pledge their life and wealth to its protection. We need a people who will come running together, whether armed with weapons or with words, upon realizing the precarious situation in which American liberty now stands. We are not yet to the point of violence, and I look to that day with a healthy level of fear and distaste, hoping that I will never need to see it. We have, however, reached the point of action, and believe it or not, the heroes we need are among the people you know.